On all the other prototype boards I seem to easily run out of holes for components and always have trouble running power to DIP package components. I like having rows of pin holes tied together like on a breadboard but on most prototyping boards there aren't enough holes to be useful. Invariably, I end up with a lot of spaghetti wiring to get everything working. 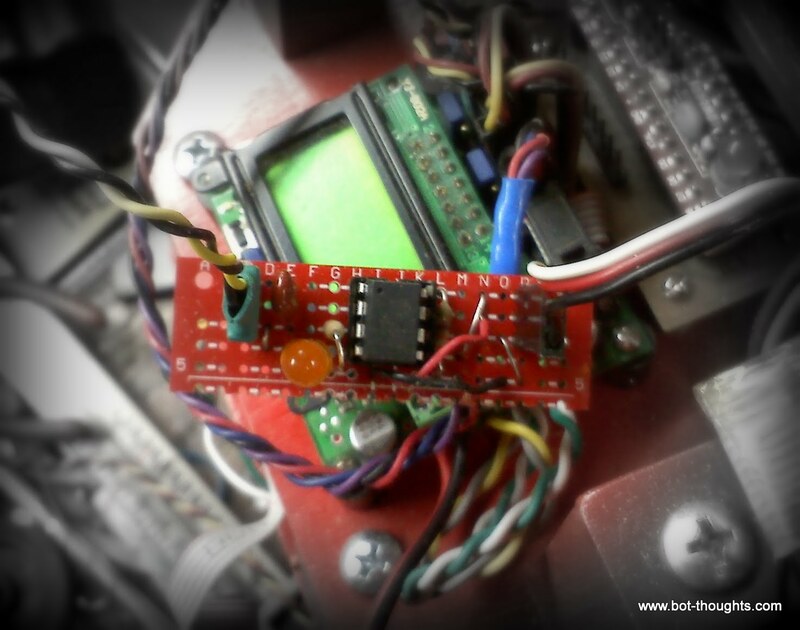 One ingenious feature of the dipmicro boards is shown below. 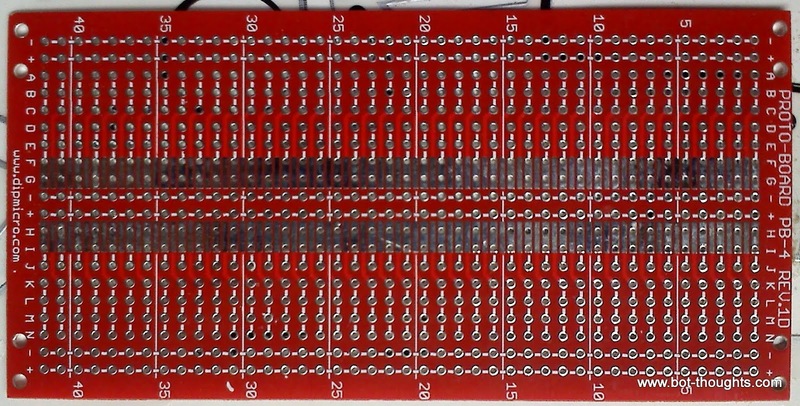 The DIP holes are connected to a string of 3 holes but you can also connect an additional strip of four more holes with a solder bridge. You could allocate 8 holes to one pin and none to its neighbor, or four to each, or none to each. That's pretty flexible. 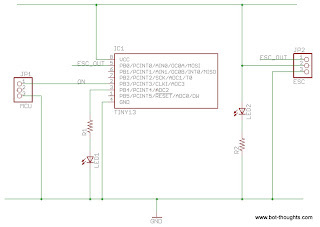 Another great feature is that there are two columns of connected pins running under the DIP package providing an easy and clean way to wire in ground and power. Finally, the boards have rows of holes for inputs. 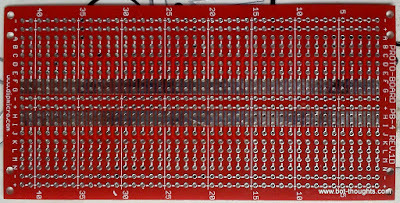 The input rows on each side are easy to connect to the four-hole sets with bus wire or regular wire. There are enough pins on the input rows to support pin headers plus a couple of other connections. There is a downside. Namely, the traces will peel off pretty easily if you overheat them or aren't really gentle. That's kind of a bummer. But if you are careful and use flux to help reduce the heat up time, they can work out pretty well. Here's my project: an Atmel ATtiny13 ESC interface. Pokey, my Trinity-style firefighting robot, now uses an R/C (remote control) airplane motor and fan to blow out a candle. I decided to replace the BJT motor controller with an ESC in prep for the Thompson Robotics Expo demonstrations. Some timer conflicts precluded sending a servo signal to the ESC directly from Pokey's Orangutan controller so in a pinch I coded an ATtiny13 to turn on the fan motor when its input signal is high and throttled it down when the signal is low. 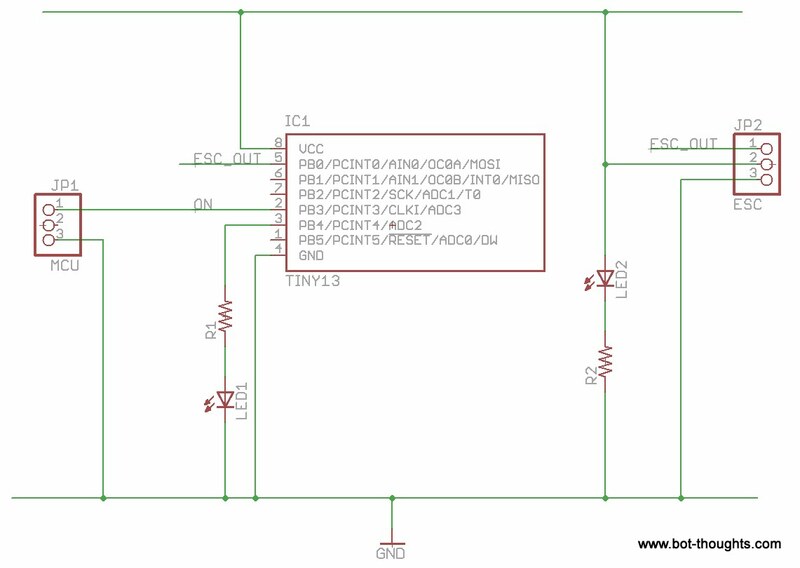 Here's the circuit diagram. I prototyped it all onto a small section of a dipmicro circuit board and it was easy as pie. Truly a pleasure to work with this prototyping board and didn't require anywhere near the mental gymastics of a typical prototyping circuit board to figure out where to put everything. And I was able to fit it all into a very compact size, too. Thanks for the tip. I had not run across these before. It makes it simple for 0.05" surface mount chips too.